When I visually saw Bourbon Sea Salt Caramel, I knew I wanted to review it. Presentation of the candle looked pretty cool and the scent ultimately sold me. The moment I smelled it… no regrets. Zero!! This candle smelled super yummy and definitely not your average caramel scent. Barrel-aged bourbon, soft caramel, course sea salt. Mmm mmm good!! That sounds perfect. Smelling the wax, I sort of smelled butterscotch, caramel and sea salt combined. Not really bourbon but then I am not an expert on what bourbon smells like so who knows. It could just be my nose. We shall see once I light the wicks. I lit this candle in my standard Bath & Body Works review room (my master bedroom) and waited for the magic to begin. It took the average 15 minutes to reach a full melt pool and from then on out… a sweet vanilla caramel with an added unique flavor filled my bedroom. It was different and I’m guessing the bourbon component played a big role in that. I also know vanilla was not listed in the scent description but I swear I do smell that as the base of this scent. The overall aroma smelled like vanilla, caramel, a teeny hint of salt along with the aged bourbon which smelled kind of smoky to me. This scent was unique and I think a candle you should probably experience for yourself to see what I mean. Strength – I would rate this candle an 8 out of 10 in a really large room so 10 in medium to smaller rooms. Loved the strength. Bourbon Sea Salt Caramel was a very different kind of bakery scent and one that I enjoyed. I wouldn’t call it the most delicious bakery scent I’ve ever smelled, but it was different. I almost want to call this fragrance a more sophisticated bakery since the aged bourbon did give it a smokier edge. Whatever it was… I liked it. Definitely check out this candle next time you’re in a Bath & Body Works store and see for yourself. You may walk away with one. 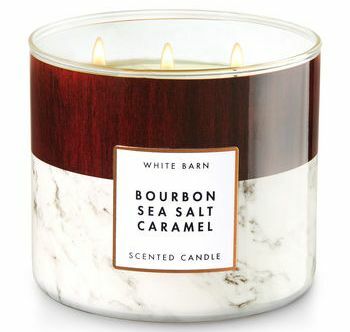 Don’t see Bourbon Sea Salt Caramel listed in Bath & Body Works website? Try one of their stores which tends to carry all their current scents, more so than online.